Yelp's bacon Wordmap for NYC. Whenever I’m trying to find a new place to take a date or a new brunch spot, the first place I check is review site Yelp. Since its founding in 2004, over 39 million reviews have been added to the site, making it one of the most data-rich sources on local restaurants and businesses. 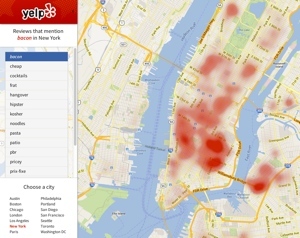 Not content to let all that data go to waste, Yelp’s data scientists have created the Yelp Wordmap, a heatmap that reveals absolutely fascinating information about the cities in which we live. For each map, you can choose from a selection of words frequently used in Yelp reviews – hipster, frat, tourist, noodles, etc. – to see which areas of the city are most associated with each word. The maps aren’t necessarily useful in terms of finding individual restaurants, but they may help you identify some new neighborhoods worth exploring. In Los Angeles, for instance, Yelp reviews clearly highlight the Silver Lake neighborhood as being home to both hipsters and their preferred beer, Pabst Blue Ribbon. And though PBR is synonymous with inexpensive in many circles, the Yelp Wordmap shows the Silver Lake neighborhood to be more “pricey” than “cheap.” Oh, hipsters. Yelp's hipster Wordmap for Los Angeles. Each map has different and interesting search terms, allowing you to find the best neighborhoods for chowder in Boston, Kosher areas in New York, and places in Los Angeles that offer all-important parking spaces. 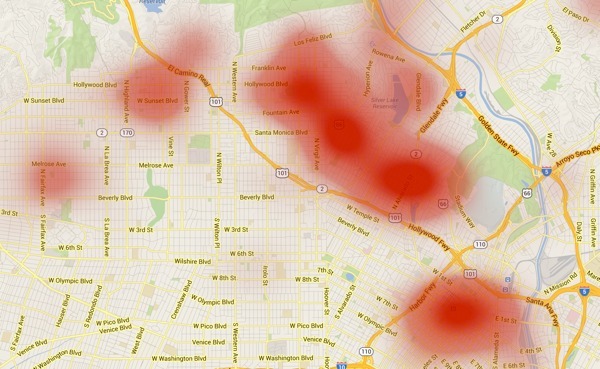 But don’t just take my word for it: You can explore the big city nearest you by visiting www.yelp.com/wordmap. Currently, Yelp has made Wordmaps available for 14 major cities: Austin, Boston, Chicago, London, Los Angeles, New York, Paris, Philadelphia, Portland, San Diego, San Francisco, Seattle, Toronto and Washington, D.C.